Cosmetic dentistry could be costly in some other places, but by coming to a dentist in Mexico, you get to save up to 70% when compared with the US and Canada. It’s true, even when you consider the traveling and hotel expenses; you will find that you’re still saving a lot of money. That’s one of the main reasons why thousands of people every week, are visiting a dentist in Mexico, to get high quality dental treatment. Great dental treatments at a dental clinic in Mexico will cost about 30% of the regular US price, what can be more awesome? A new smile with veneers or zirconia crowns. Create a perfect look for yourself with Dental Veneers. This simple, yet effective, cosmetic dentistry treatment can transform your smile, making you look more attractive and boosting your self-confidence. Nowadays, we’re all looking for tips on how we can improve our appearance. Cosmetic dentistry is becoming more popular as people understand that a pleasant smile goes a long way to enhancing their look. Dental veneers are made of a thin layer of tooth-coloured ceramic material that cover the front surface of a tooth. Veneers will give the teeth a better shape, fill in gaps, and give a nice consistent colour. Basically, they are useful for disguising the tooth, which you may want covered to hide its size, shape, or colour. There are different materials, of porcelain, or zirconia, and whether a veneer, or a crown is needed to cover the tooth, will depend on the characteristics of the individuals mouth. Teeth with gaps that separate the teeth. 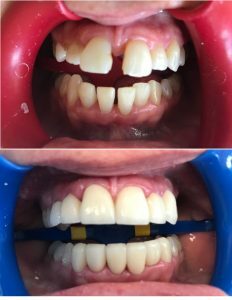 Rather than expensive and time-consuming orthodontic treatment, dental veneers or sometimes crowns, can be often be used to straighten the crooked teeth, and realign them. The treatment is much quicker than braces. Usually within a week, you can leave with a new smile. Depending on how many crowns or veneers are needed, It can actually be actually less expensive than an orthodontic treatment.